Consider the squash. Unmistakable in taste, yet surprisingly subtle. Savory, yet easily roasted to sweetness. Hearty and earthy, full-bodied and warming. Is it so surprising that bartenders are digging it out of the kitchen and putting it to use in winter cocktails? At Sepia, head bartender Joshua Pearson dry-roasts butternut squash, then adds it to a bottle of 1792 bourbon, letting it infuse for a week. “Bourbon has that nice roasted, toasty character from the oak aging” that gets enhanced by squash, Pearson explains. 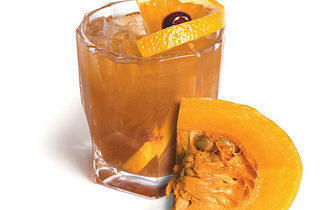 The bourbon-squash mixture is then put through a chinois and used for Pearson’s New World Old Fashioned (pictured), a combination of muddled orange and brandied cherries, a dash of smoked cocoa bitters, a small amount of ancho-spiced maple syrup—and, of course, the squash-infused bourbon. Twenty miles west, at Vie in Western Springs, the inspiration for the Hot Squash Buttered Rum happened far away from the bar: The pastry chef, Todd Feitl, turns a combination of buttercup and butternut squash into a not-too-sweet, thick and pasty butter, seasoning it to evoke the flavors of pumpkin pie. Then he hands it off to Michael Page, the bar manager, who simmers it with 10 Cane rum, Drambuie whiskey, anise and cinnamon and serves it warm. 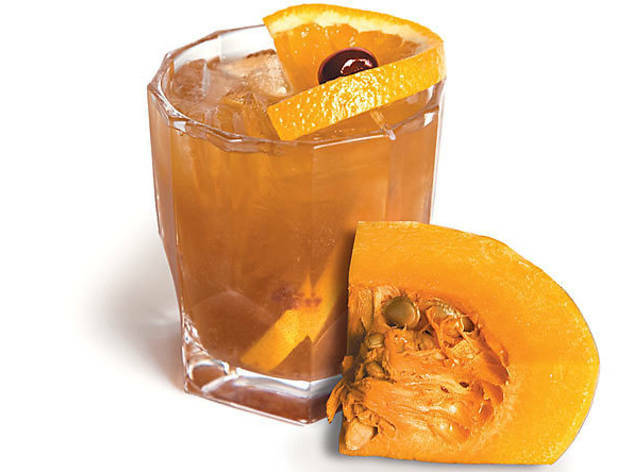 Meanwhile, Nacional 27’s Adam Seger uses the holiday season as a chance to rethink eggnog, using a different type of squash—the slightly sweet calabaza—to give pumpkin-like flavor to the classic, rich drink. But enough “considering” already—who’s ready for a drink?